Polycom, the Rolls Royces of Business Media Phones. There are a ton of VoIP phone vendors in the market today, and they certainly run the gamut on quality. When we sat down to choose which phones to pair with our service, it really was a no-brainer for us to go with the best: Polycom. They make some of the best voice over IP business phones on the market, including their amazing VVX business media phones. They pride themselves on quality and that lines up perfectly with the experience we want you to have with our service. The only problem is, these phones can be a little pricey. You get what you pay for, and all that. Only - in this case - we're including these phones with no upfront expense as long as you use the service. Polycom VVX 250 - Included! 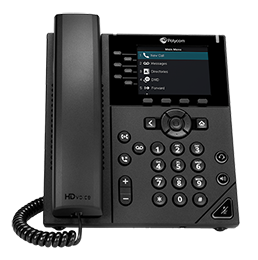 While easy to use and perfect for small or home offices, there's nothing really "entry-level" about Polycom's VVX 250 business media phone. High-def voice technology helps you to sound great on every call, including an "Acoustic Fence" feature that creates a barrier to block out outside sounds. This phone boasts tons of time-saving keys like one-touch Speed Dial & Redial, a crystal-clear speakerphone, and an easy-to-navigate 2.8" color display to delight any user. Did we mention that this phone - which retails for up to $130+ and we're including this with your monthly service? Polycom VVX 350 - $2 / mo. The biggest boast of the VVX 350 is taking the display area up to a beautiful 3.5" color display (compared to 1.8" for the VVX 250). For anyone using a phone a good portion of the day, a giant color interface can be more than just an extra trimming - it can be a direct efficiency gain and productivity booster. 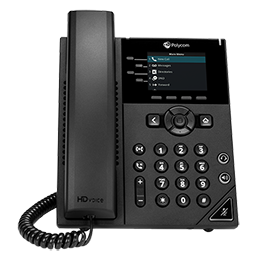 Polycom VVX 450 - $3 / mo. Now we’re talking. This premier business phone ups your screen real estate up to 4.3" to provide you with an engaging experience at a glance at an affordable price. 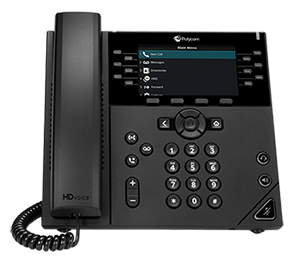 To tickle your eardrums, this phone also includes Polycom’s HD Voice and Acoustic Fence features giving you superior clarity call after call. On the technical side, the VVX 450 features dual USB ports and a two-port GigE switch to take advantage of high-powered office networks.